This album is what Joy Division might have been like if only they'd had a bigger ambition and a bigger budget. 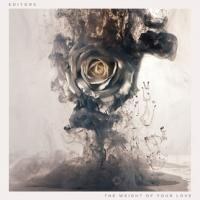 In a review of the last Editors album, In This Light and On This Evening, PopMatters’ Jennifer Cooke wrote, “One of the best things about Editors has always been that they take themselves just that seriously. Let’s hope they remember that next time around.” Well, this time around for their fourth album, The Weight of Your Love, the Birmingham, England group has certainly taken themselves very, very seriously. While the band earned comparisons earlier in their career as being the British Interpol, and In This Light and on This Evening was much more of an electronic affair – a deviation, perhaps, from their signature sound – The Weight of Your Love retains just a little bit of that Interpol-ness (the song “Formaldehyde” might be the best song that Echo and the Bunnymen never wrote, for one) while adding something else to the mix. That something else can be summed up by an underground comic I read some time ago: Imagine a marquee for an arena reading that the band Rock will be playing later that evening. Certainly, there’s a big arena rock sound to The Weight of Your Love that might have some listeners reaching for Coldplay comparisons, even though frontman Tom Smith has indicated that the sound of the record was influenced by “American” bands such as R.E.M. and Arcade Fire. (Nevermind the fact that Arcade Fire is Canadian.) Now, I tend to like the odd Coldplay song here and there, but their sound is so generally bland and forgettable that I tend to think that the emergence of that group is akin to the breaking of one of those seals that herald the coming of the apocalypse. However, there’s more to The Weight of Your Love than mere Coldplay flattery. Smith, at times, sings like a dead ringer for, believe it or not, Bruce Springsteen, and the acoustic-led songs “The Weight” – sadly, no, not a cover of the infamous song by the Band – and “The Phone Book” could, if you stripped the songs down to their barest essentials, snuggle quite nicely onto Nebraska. And the lyrics are as cold and barren as any Joy Division song, another band Editors generally get compared to. “The Weight” offers “I’m a lump of meat / Where the heart beats / Electricity / Restarts me”. “Sugar”, meanwhile, says, “It breaks my heart to love you”. So, mope rock this is to a degree. However, The Weight of Your Love proves that moping can be fun, if you allow yourself to get enrapt in the sentiment and Smith’s assertion that “I want to sing about death”. Ian Curtis, please hand your rope over to Tom Smith. It appears that the more that things change – this album sees the departure lead guitarist Chris Urbanowicz and his replacement in the form of two new band members, Justin Lockey and Elliott Williams – the more that things tend to stay the same. The Weight of Your Love generally works as a coherent whole, with song after song building on the epic scale of depression that the lyrics and sonics bring to the table. With its strings and Middle Eastern feel, “Sugar” feels ripped from the Led Zeppelin songbook around “Kashmir”, and when the strings dive bomb as they do toward the end of the track, it’s an exhilarating feeling. Lead single “A Ton of Love” has a hook at the start that seems oddly familiar – the song that it’s lifted from is on the tip of my tongue but nothing wants to spit out – and is the sort of thing that will get fists in the air deep in the back rows of said arena that the group is positioning itself to play. The whole thing could be almost a very Simple Minds castoff, at least when that band was at their commercial peak. The piano ballad “What Is This Thing Called Love” is the band’s most overt Coldplay moment, with Smith aping Chris Martin’s falsetto, and when he sings “I’ve been your lover for the last time”, you can imagine a million hearts being broken simultaneously. “Nothing” is an epic track with dewy strings, and Smith once again sounding like a dour carbon copy of the Boss. But what are arguably the album’s two best songs come with the aforementioned “Formaldehyde” and the very, incredibly Interpol-sounding “Hynea” – no, not a cover of the R.E.M. song, but perhaps a reference to a certain Siouxsie and the Banshees album. After that, the album kind of lops off and trudges to the finish line, though final song “Bird of Prey” is a simmering rocker that kind of sticks and resonates, such as its position as the last thing heard on the album. So that essentially leads one to conclude that The Weight of Your Love is a pleasant rock album, though one that is hardly essential. However, as a marriage between American and British stadium rock, with some nods to Indie Nation thrown in, it is memorable in its own right. It’s hardly going to break any new ground, but it might allow Editors to escape from their past to some degree, and allow them to branch out and explore new – albeit, already charted – territory. It’s readily apparent from The Weight of Your Love that the band is, indeed, taking itself very gravely, and wants to rock out in the biggest, most impressive fashion that it can muster. It’s still a bit lumpy, and there are obvious highlights and the occasional trudge through the mud, but there’s a special place that Editors may find themselves performing upon the release of this affair: A British town, not far from London, in a place called Arena. All that Editors have to do is change their name to Rock, and they're more or less pretty well set. The Weight of Your Love is an anthemic piece, and fans will already have their Bic lighters ready and a grim visage for this. The album is what Joy Division might have been like if only they had a bigger ambition and a bigger budget. And that’s something, as formulaic as The Weight of Your Love can be, to take pretty seriously.